I purchased my K7 as an upgrade to my aged K20D. And my K20D went into CRIS for repair with its shutter and aperture control unit. I was just out of 3 year extended warranty period and the repair came out of my own pocket. It was a devastating experience to have my 2nd Pentax body dead in my hands while shooting. 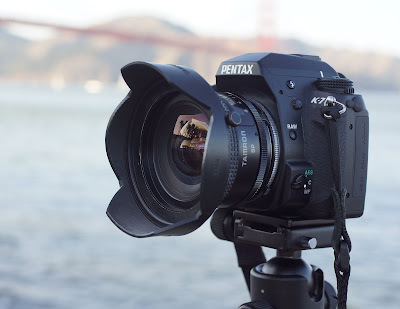 My first dead Pentax was my beloved white Pentax K-x which became faulty on its SD memory card controller. CRIS did a wonderful job in this 2nd repair and restored my K20D to its good state and I was pleasantly surprised with inexpensive charge of $140 for replacing both the shutter and aperture control units. CRIS has restored my confidence with Pentax repair. Unlike my 1st repair that took over 6 plus weeks due to parts back ordered from Japan and this second repair took a little over two weeks. I bought my K7 while my K20D was in service. I was thinking of selling my K20D once it got back from service but I now keep the two as a pair. Cameras do fail and I intend to have dual similar bodies to guard against the odds of camera failure. And in my recent planned trip to Hong Kong and Macau, my purchase of Sony NEX 5N has taken all the attention from me as a new owner and I have left my K7 out of sight for two months until last weekend. I happened to find time in visiting Crissy Field in San Francisco and I had my repurchase lens with Tamron SP 17mm f/3.5 adaptall-2 51BB. The 17mm was a later version to 51B and it does not have the built in optical filters like its earlier copy. But I like my new copy that came with the hard to find matching push on lens hood. I have to take my time to learn K7 in more detail. Its body is a welcome upgrade to K20D. I especially like the changes in the grip, much improved LCD, a very welcome 100% viewfinder and a refined tougher build in a slightly smaller body. I especially heart the electronic level indicator in the field. But I have the most difficult time on the SD card removal mechanics. I curse the camera every single time that I have to take out a SD card from it. Undoubtedly, I like my K7 upgrade but I think I get a very map K7 when indeed I use it much less often than my 5N. It isn't fair but I am aware of many of its negatives such as lesser-than-ideal high ISO noise, the possibility of shutter induced blur on wide angles in around 1/100 sec and many baggage similar to that in K20D. I try to shoot it like a mad boy while listening to some good music to clear up my concerns on this Pentax fine camera with K7. good stuff...my kx is my main one and have an ist Ds for back up which hasn't seen much use. Looking for either a k10 k7 or even a k-01 to pair with the kx.